This slick, techno typeface is heavily inspired by the character logo of Takara’s Beast Wars Metals series. Includes full alphabet, extended punctuation and accents, Euro. 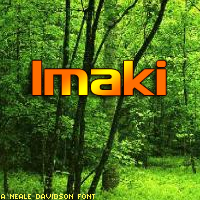 Imaki is available in bold, italic, bold-italic, and condensed weights.